"Our Engagement Shoot Got Photobombed By A Texas Miata Club"
The best stories are born when the unexpected happens. That's even more true when Miatas are involved. Just ask Catherine Lee, a friend of mine who lives in Texas and whose engagement photo session ended up being quite memorable after it overlapped with a San Antonio-area Miata club's Christmas party last weekend. She and her fiancée were doing their shots at a ranch near Seguin where they're getting married later, but they had to share the venue with some rowdy roadster enthusiasts for just a bit. She sent me the picture above of the cars at the ranch. I had asked the wedding coordinator if we could take pictures out there and he said that would be fine, but there was an event going on at one of the facilities. As we walked around the grounds taking our pictures we saw that one of the buildings was decorated for a Christmas Party. People slowly started to show up, including a photographer in a Santa hat. We figured it was just some sort of company christmas party but noticed that there were a few Miatas parked in the grass field. A few minutes later, what looked like a parade of them started driving down the long dirt road from the entrance gate. People were everywhere in Santa hats, all getting out of their Miatas. 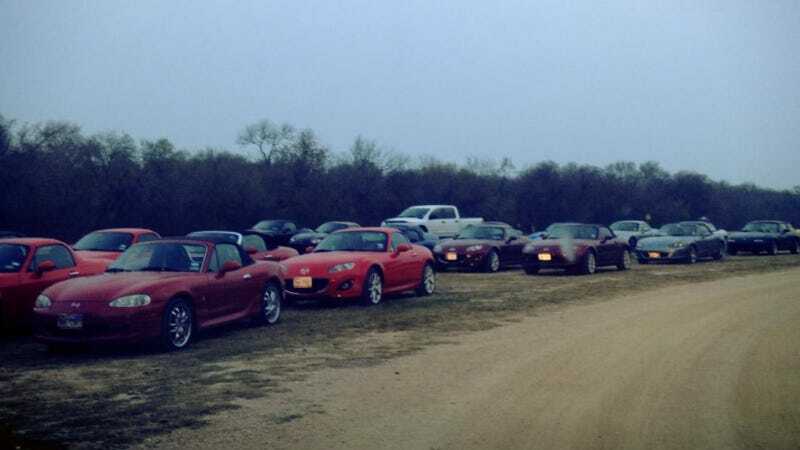 Most likely it was the Bluebonnet Miata Club and their friends, who had their Christmas party at the same ranch on Sunday. She said she thinks something like 60 Miatas were in attendance. We continued to take our pictures on the ranch as the Miata club came by on a hay ride to check out the longhorns. They waved as they drove by and someone yelled "smile!" They watched the owner feed the longhorns and then continued on the hay ride around the property. About that time it started getting dark and we left, as more miatas trickled into the ranch! Luckily, she said she was able to get the engagement photos done. They had to cancel the photo shoot once before because of illness, and so she said she was going to make it happen regardless of what happened. Of course, this is a Texas Miata club hanging out on a ranch full of longhorns, so their party wouldn't be complete without some country shenanigans. We were taking pictures with the longhorns in the background as they were coming by on the hay ride. They drove by a couple times, and at that point we got up to walk to a different area. They stopped the hay ride and the owner called out "sorry, we have to be back in this area". We said it's ok because we were done with the longhorns anyway. We walked to a different area and finished up our pictures, and as we came back by he had a big bucket and was feeding one of the longhorns and he was having them yell "yeehaw" in unison. We went back to our area, changed into our clothes, got our stuff together, and as we drove out they were still looking at the longhorns! Luckily the ranch was big enough to where we had plenty of other picture spots. I really wanted some longhorn pictures though so I'm glad we didn't wait any longer to do those. I probably would have told them to drive around a while longer! No word on whether the Miata club will be invited to the wedding. What group of car owners would you least want to show up at your wedding?